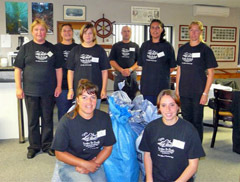 News and photos of cruise ship visits to the world's most remote community during the 2012/2013 season. 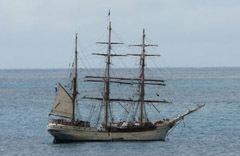 The Barque Europa began her visit on 15th April and is seen here anchored that day off Tristan. 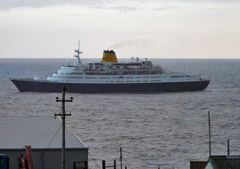 The ship is a regular visitor and last called in April 2012. MS Plancius arrived on 16th April. the ship made its inaugural Tristan visit in 2011 but unfortunately broke down in South Georgia on its 2012 voyage. The sailing ship Barque Europa arrived at Tristan on Monday 15 th April to a calm sunny day. She was due to arrive the day before but weather was not in her favour. However, I think this was fortunate as sea state at our anchorage was not good and no landing would have been possible. Visitors disembarked at 8:30am and we were all over the moon as this had been the first landing of the season. After everyone had disembarked, they were all taken to the Tourism Centre, where everyone was welcomed to the island and informed of the day’s programme. 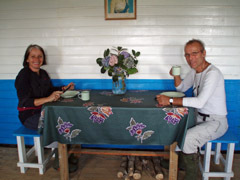 Everyone was soon busy shopping and enjoying cups of coffee and lobster sandwiches. A walking tour of Edinburgh for five visitors began at 10.00. Outside two taxis were waiting ready to take anyone on a ride to the Potato Patches and our novelty tractor ride waited for interested people interested in a ride around the settlement. 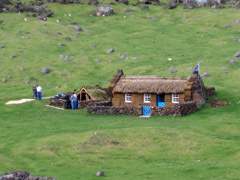 On the other side of the settlement our newly built Thatched House Museum was opened. The pensioners who built the house were there with a local guide, ready to show everyone around and tell them how the house had been built. 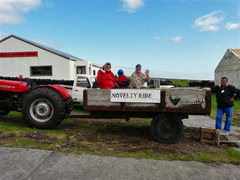 A tour of St Marys School, walk to the 1961 Volcano, golf match, walk to the Potato Patches and factory tour was also scheduled throughout the day. This was well attended and enjoyed by all. 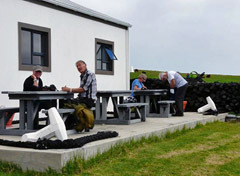 The Albatross Bar was opened and everyone was able to enjoy a drink in the World’s remotest pub. At 4:30pm everyone had to be back to the harbour to go back to the ship. as once again the island lived up to its name in poor local sea conditions. On 16th April a trip was planned to visit Nightingale. 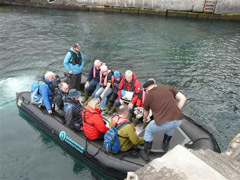 However it was not suitable for landing so visitors came ashore to spend another day on Tristan. A great many went on a Hike to the base with Justin and Jerry Green. The remainder enjoyed a free day ashore where they soaked up the sunshine and did more shopping. To add to this the MV Plancius arrived at midday so we had two ships anchored offshore. Visitors came ashore from the Plancius and soon there was a throng of visitors around the island. This was a great sight as the season had been an unlucky one and these were the first landings. The Plancius and Barque Europa passengers had a great day ashore catching up on each other’s travels and enjoying the sights of the island. 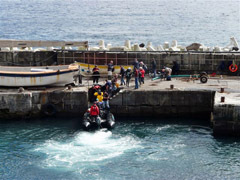 At 15.15 Barque Europa visitors had to return to the ship as the Captain wanted to leave for Cape Town by 16.00. The Plancius visitors enjoyed an extra hour ashore and had to embark at 17.00. 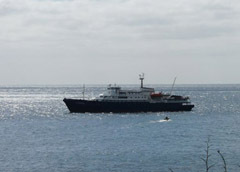 On 17th April MV Plancius visited Nightingale Island with local guides. A landing was made and all enjoyed the day ashore. The ship then proceeded to Inaccessible Island but unfortunately the weather was not in their favour and a landing was not possible. 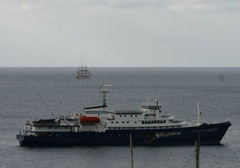 The Plancius returned to Tristan and dropped off local guides and anchored offshore for a third day at Tristan. Unfortunately the morning of Thursday 18th April brought winds from the North and the swell had started to increase. The harbour master decided that the sea state was not possible to land passengers. The Plancius waited around for another hour in which time weather had deteriorated even more. Unfortunately the ship had to up anchor and set sail for St Helena Island. The Saga Ruby arrived at 7am on Easter Monday 1st April and yet again weather was against us. However, it was not all doom and gloom and even though we did not manage to land passengers the island RIBS took Immigration, handicraft and postal personnel on board. Trevor Glass the island Conservation Officer did a wildlife slide show onboard which proved very popular. 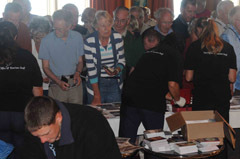 Conrad Glass did a talk on "my life and work on Tristan da Cunha" followed by a book signing. While visitors were busy shopping onboard and listening to the highlights of Tristan, two of the ships cameramen came ashore and were escorted around the village by Lewis Glass one of my local guides. 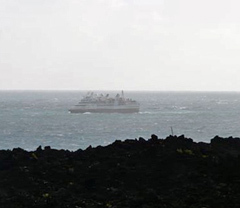 They came to photograph the highlights of the island to take back to the ship to show everyone onboard. Vendors stayed onboard until about 12.30 and then all were brought back ashore, sales were very good and everyone was pleased with the outcome. and given her current name. 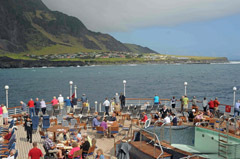 So near and yet so far - passengers enjoy the view of Tristan da Cunha from the lido deck but can only imagine a day spent ashore. 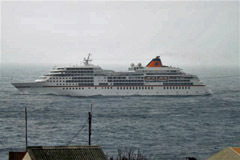 Weather was very disappointing for the visit of the MV Silver Explorer. Once again it was against us and we were unable to land visitors. Our third ship of the season and we have still not managed a landing at Tristan. 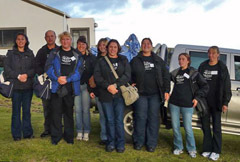 A visitors programme had been put together for the visit and all plans were in place. The Thatched House Museum would have been opened for visitors, with the construction team and a Museum Curator present. They would have assisted showing the visitors around and taking any questions. 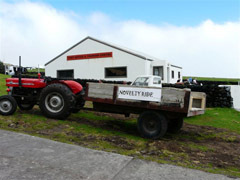 We have still not had the opportunity to open the Museum to a large amount of visitors. 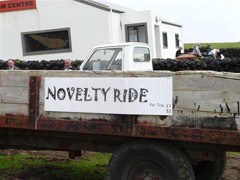 It was also hoped to trial novelty Tractor rides around the settlement. The high vantage point on the tractor would have given lovely views of the village and would have been a great fun ride. All was not lost with the Silver Explorer, as we managed to get our Administrator and Mrs Burns aboard with some post and handicrafts for sale to visitors. It is hoped that although a landing was not possible visitors will still be able to take a little piece of Tristan away with them. Presently we have three more ships due before our season ends, MV Saga Ruby which just confirmed a booking a few weeks ago, SS Barque Europa and MV Plancius. It is just hoped that luck will change and the last three ships will be a success. We would like to say to all our unfortunate visitors how sorry we are that they could not have experienced our lovely island. We hope you will not give up hope and all book to visit again. Unfortunately, although we aim to please the weather is something we have no control over. 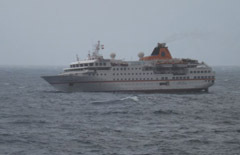 Dawn Repetto was again disappointed when MV Hanseatic arrived late on Christmas Eve and a landing was abandoned as the weather had by then deteriorated from the north-west and neither ship or island RIBs were able to be used either to reach the vessel or bring passengers ashore. Therefore none of the three planned December cruise ship visits proceeded as planned. Dawn's images above show the ship off Tristan in the late afternoon and the angle of the ship in the water clearly shows impossible conditions to land. Dawn Repetto reports on break-up day Friday 21st December that MV Plancius has confirmed a return visit on 16th-18th April 2013. The ship first visited Tristan in 2011, but a breakdown in South Georgia during a 2011 cruise meant the Tristan visit was cancelled earlier this year. Plans are well in advance for the return on MV Hanseatic on 24th December. After the twin disappointments of the Island Sky cancellation and poor weather preventing Europa landing passengers on 13th December, all are hoping for a fine day with calm sea conditions so Hanseatic's passengers can enjoy a special Christmas Eve ashore and be the first visitors to visit the new Tristan Traditional Thatched House Museum. 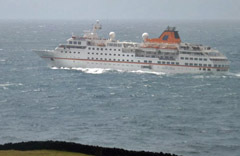 Following the cancellation of MS Island Sky's visit disappointment was compounded on Thursday 13th December when the cruise ship MS Europa was unable to land passengers due to poor sea conditions. 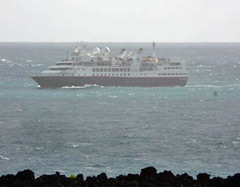 So the island community is now hoping that the weather is favourable and that the remaining December planned arrival MV Hanseatic will be able to land visitors on its planned Tristan da cunha stop on Christmas Eve. The visit of Nobel Caledonia's Island Sky, scheduled for an extended New Year stay from 29th December - 1st January, was cancelled as the vessel broke down in the Cape Verde Islands in November and had to divert to Lisbon for engine repairs. 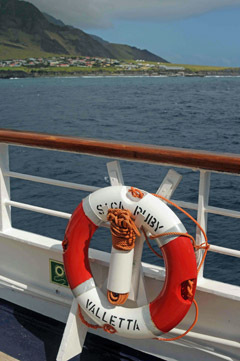 So subsequent cruises to West Africa from Cape Verde to Cape Town, the Tristan cruise from Cape Town and onwards via South Georgia, Falklands to Chile, and further cruises in the Pacific, have also been cancelled. See Island Sky 2012 Visit page for a report of Island Sky's first Tristan visit. 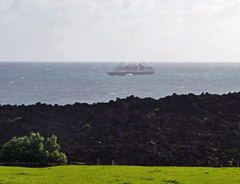 After this year's cancellation of MV Plancius's 2012 visit (see 2012 Shipping News) this is a great disappointment for the island community and will severely reduce crucial revenue for the Tristan Tourism Department. Dawn and her team have worked hard to develop new activities and facilities for visitors, including the splendid new Tristan Traditional Thatched House Museum (see Thatched House Page for details).